A woman comes to me one day looking for advice on her relationship. She explains how she is having issues with her boyfriend and they constantly get into arguments and negative behavior. They have been together for some years now and have had good and bad times (for the record almost every relationship has “good times” so let’s stop using that as the basis for holding on). She then says how she has stuck by him through it all; financial issues, verbal abuse, and all the other women because she is a ride or die chick. Ok let’s stop right there. Do you see what this woman did? She basically used the glorified label of ride or die chick to validate and defend her staying in an unhealthy relationship. Let me make this clear, it is in my opinion that you don’t get a badge of honor for sticking through nonsense. You are not exhibiting strength by holding on to a man who treats you like crap and/or disrespects you consistently by having other women. You don’t earn points for this at all, just a lot of pain, frustration, emotional damage, and more time that you are not getting what you truly deserve. Don’t get me wrong, I do think there are some things that I feel deserves a lot of admiration when a woman works through it. A ride or die chick to me doesn’t drop her man because his money isn’t right. She understands that we all go through rough times and what that man needs right now is your love and support. At the same time she doesn’t hold on to some man who wants to sit his behind on the couch and make no effort to provide for the couple. He should have a desire to make something of his life and if not then you should not be expected to sit there and be his mother. A ride or die chick to me won’t allow others to destroy her relationship. She will stick by her man and the relationship will stand or fall based on his actions not the words and actions of others. On the flip side she won’t just make herself oblivious to his disrespectful behavior and view others calling it out as them just “hating”. She won’t sit there and act like it’s all good when in reality it is destroying her on the inside and causing so much damage. A ride or die chick will defend her man against other people trying to tear him down and attack him. She won’t stand for you disrespecting her man and she will have no problem checking you on the matter. Yet she doesn’t sit there and let this man think his unhealthy behavior is really ok. She will have no problem addressing the issue and expecting better from her man. She will be that chick you need but she will not continue to accept him being less of a man than she needs. This is all just my opinion. Maybe I have it wrong and a ride or die chick is truly supposed to embrace all the nonsense that a man wants to throw at her. If this is truly your definition, then so be it, just don’t use that label like it’s a good thing when it really isn’t. Too many women think they are doing something special or commendable by holding on to situations that are not best for them. Sometimes it’s not even a man who does all this wrong, just a man who the woman deep inside feels is not for them regardless of how “good” a guy he might be. Ladies do not use the label of ride or die chick to hide the fact that your motivation to hold on to that relationship and that man isn’t really about how loyal you are. Most of you are scared and acknowledging that may help you see what you might need to do next. Many of you need to ride your behinds out of that relationship, or you will die being a chick that doesn’t get the love and relationship that you truly deserve. Do you want to receive the love and relationship you truly deserve? 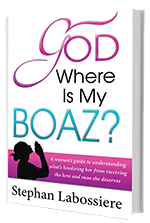 Go right now and get your copy of the bestselling book God Where Is My Boaz on sale now here on Amazon or in Audio Book format. You can also get the PDF version HERE women everywhere are calling it “a blessing to read”.